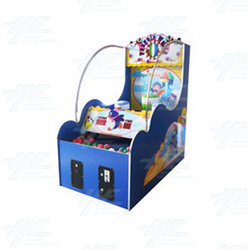 A ball toss ticket redemption machine suitable for 1 or 2 Players. In the game, players must throw balls into the opening top of the cartoon penguins. The top of the penguin opens and closes continually, so the player must time their throws well. The more balls the player lands in the penguin, the more tickets they win.